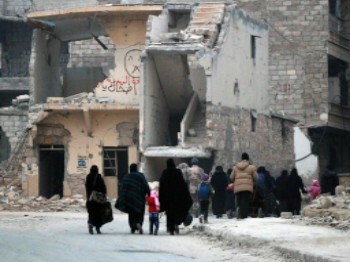 The humanitarian situation in Aleppo is a disaster. The various world bodies are unable to aid, and are locked into dimensions of global power politics. This is a time for us as people of faith, of different faiths, to pray. We would like to ask you to take 2 minutes a day to pray for the people of Aleppo. Let us pray for their safety and security. Let us pray for a solution to their plight. Let us pray for compassion in the hearts of leaders and of ordinary men and women towards one another. Let us pray that children and adults are protected. Let us pray that bloodshed stops and that humanity lives the ideals of brotherhood for which it was designed. Please find the time to think and pray for Aleppo in your own daily rhythm. If you are a leader of a religious community, please incorporate two minutes of prayer (or silence) into the religious services of your community. Let us awaken our feeling and consciousness, as we turn our prayers upward for protection and wellbeing of all.